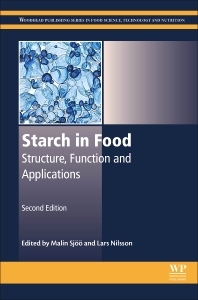 Starch in Food: Structure, Function and Applications, Second Edition, reviews starch structure, functionality and the growing range of starch ingredients used to improve the nutritional and sensory quality of food. The new edition is fully updated and brings new chapters on starch and health, isolation, processing and functional properties of starch. Part One illustrates how plant starch can be analyzed and modified, with chapters on plant starch synthesis, starch bioengineering and starch-acting enzymes. Part Two examines the sources of starch, from wheat and potato, to rice, corn and tropical supplies. Part Three looks at starch as an ingredient and how it is used in the food industry, with chapters on modified starches and the stability of frozen foods, starch-lipid interactions and starch-based microencapsulation. Part Four covers starch as a functional food, investigating the impact of starch on physical and mental performance, detecting nutritional starch fractions and analyzing starch digestion. The book is a standard reference for those working in the food industry, especially to starch scientists, food researchers, post-docs, practitioners in the starch area and students. Dr. Sjöö has published a number of articles on starch functionality and has been involved in the investigation of the behaviour of cereal components like proteins, starches, arabinoxylans, and lipids on a molecular and colloidal level, thus trying to understand how these properties are related to the quality of products, for example bread, cakes and pasta. Associate professor in Food Colloids at Lund University. PhD in Food Technology, Lund University 2007, expertise with/in surface and Colloid Chemistry, Emulsions and Foams, Field-flow fractionation, Instrumentation, Proteins, Polymer characterization.